Histone Deacetylase (HDAC) Activity Assay Kit (Fluorometric) ab156064 detects HDAC activity in lysates. The HDAC Activity Assay Kit is primarily designed for the evaluation of HDAC inhibitors using a crude HDAC fraction. Also, any cultured primary cell, cell line, or tissue homogenate can be assayed for HDAC activity with the kit if the appropriate dose of HDAC specific inhibitor e.g. Trichostatin A is used. The HDAC activity assay protocol is based on an acetylated peptide which is conjugated to AMC. AMC is a fluorescent dye and its fluoresence is quenched when conjugated to the peptide. When the HDAC de-acetylates the peptide, it becomes susceptible to cleavage by an enzyme (the Developer component). This then releases free AMC, which can be measured using a fluorescence microplate reader (Ex/Em 355/460 nm). The HDAC assay has been shown to detect the activity of the HDAC family, at least class I HDACs in Human or animal cell lysates or in column fractions. 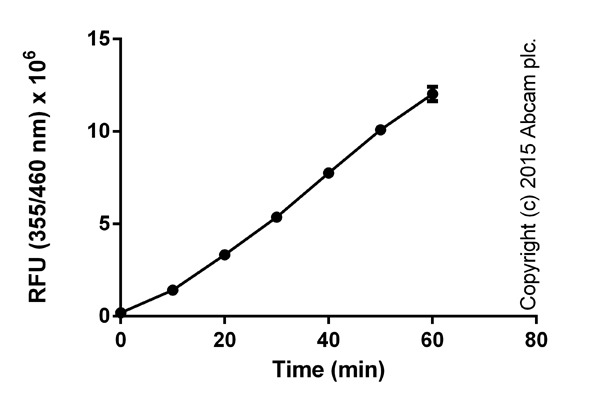 The assay shows good linearity of sample response. The assay may be used to follow the purification of HDACs or may be used to detect the presence of HDACs in cell lysates. 1. Monitoring the purification of HDACs including HDAC1, 2, 3 and 8. 2. Screening inhibitors or activators of HDACs. 3. Detecting the effects of pharmacological agents on HDACs. Histone Deacetylases (HDACs) are a class of enzymes responsible for the deacetylation of lysine residues on the N-terminal part of the core histones (H2A, H2B, H3 and H4), allowing the histones to wrap the DNA more tightly. HDAC proteins occur in four groups (class I, class IIA, class IIB, class III, class IV) based on function and DNA sequence similarity. Classes I, IIA and IIB are considered "classical" HDACs whose activities are inhibited by trichostatin A (TSA), whereas class III is a family of NAD+-dependent proteins (sirtuins) not affected by TSA. Class IV is considered an atypical class on its own, based solely on DNA sequence similarity to the others. Responsible for the deacetylation of lysine residues on the N-terminal part of the core histones (H2A, H2B, H3 and H4). Histone deacetylation gives a tag for epigenetic repression and plays an important role in transcriptional regulation, cell cycle progression and developmental events. Histone deacetylases act via the formation of large multiprotein complexes. Deacetylates SP proteins, SP1 and SP3, and regulates their function. Component of the BRG1-RB1-HDAC1 complex, which negatively regulates the CREST-mediated transcription in resting neurons. Upon calcium stimulation, HDAC1 is released from the complex and CREBBP is recruited, which facilitates transcriptional activation. Deacetylates TSHZ3 and regulates its transcriptional repressor activity. Deacetylates 'Lys-310' in RELA and thereby inhibits the transcriptional activity of NF-kappa-B. Component a RCOR/GFI/KDM1A/HDAC complex that suppresses, via histone deacetylase (HDAC) recruitment, a number of genes implicated in multilineage blood cell development. Ubiquitous, with higher levels in heart, pancreas and testis, and lower levels in kidney and brain. Belongs to the histone deacetylase family. HD type 1 subfamily. Sumoylated on Lys-444 and Lys-476; which promotes enzymatic activity. Desumoylated by SENP1. Phosphorylation on Ser-421 and Ser-423 promotes enzymatic activity and interactions with NuRD and SIN3 complexes. Phosphorylated by CDK5. Ubiquitinated by CHFR, leading to its degradation by the proteasome (By similarity). Ubiquitinated by KCTD11, leading to proteasomal degradation. Butyrate, propionate, and TSA inhibited HDACs activity in HUVEC. HDACs activity were inhibited in HUVEC by treatment of butyrate and propionate. The results were normalized using the control as 100%. 8 uL (corresponding to 6.7e6 cells) of nuclear extracts (ab113474) from HL60 cells were assessed kinetically (+/- SD). Different volumes of positive control, with inhibitor (TA), kinetically read (+/- SD). Measurement of HeLa cell endogenous HDAC1 in an immunoprecipitated sample with anti-HDAC1 antibody and following the Histone Deacetylase (HDAC) Activity Assay Kit (Fluorometric) (ab156064) protocol. Measurement of HeLa cell endogenous HDAC2 in an immunoprecipitated sample with anti-HDAC2 antibody following the Histone Deacetylase (HDAC) Activity Assay Kit (Fluorometric) (ab156064) protocol. Publishing research using ab156064? Please let us know so that we can cite the reference in this datasheet. We have a customer who has asked the following about the Histone Deacetylase (HDAC) Activity Assay Kit (Fluorometric)(Ab156064) "I would like to know if it detects activity only against Class I HDACs or global HDAC activity"
I have looked at the product datasheet and the sentence regarding this was unclear -"shown to detect the activity of HDAC family, at least class I HDACs in Human or animal cell lysates or in column fractions." Unfortunately, I cannot tell you which of HDACs can be measured with certainty, because the lab has measured ab156064 only with crude HDACs fractions of some cell lysates, and recombinant HDAC1, 2, 3 and 8.